When I have a limited amount of time to cook supper, especially if it is just supper for one, then this is what i usually make. It takes about 10 minutes from start to finish and I find it delicious. I always have potatoes, red onion and creme fraiche in my kitchen, and roe most of the time too. Because caviar is so salty it keeps in the jar for quite a while in the fridge, so it is easy to have some at hand. All you need to do is to peel those potatoes, grate them and melt some butter in a frying pan. And how good does that smell?! – melted butter. Yum. Then place little heaps of the grated potatoes in the frying pan, flatten them with a spatula and season a little. Wait until they’ve browned on one side before turning, so place a dollop each of caviar and creme fraiche on your plate and chop half a red onion. 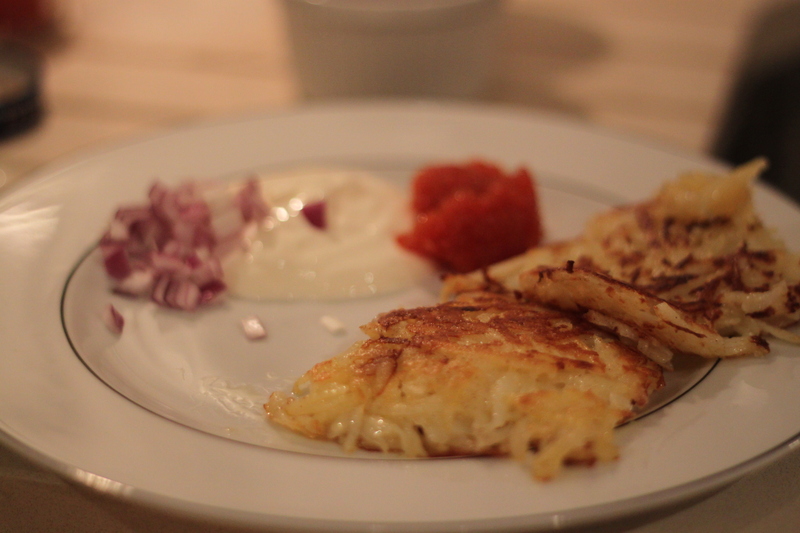 Now it is time to turn the rosti and you let them brown and crisp on the other side too. Sprinkle on some more salt and pepper and as they’re done, transfer to your plate and enjoy.